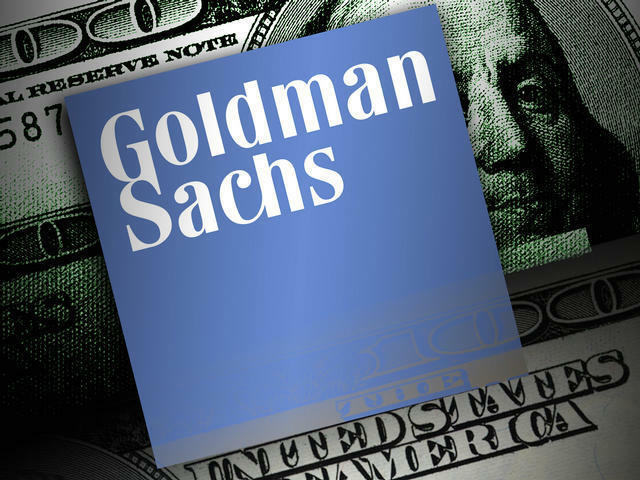 NEW YORK - Goldman Sachs (GS) turned in third-quarter earnings Tuesday that easily beat analysts' estimates, but the bank's mood seemed more cautious than celebratory. Revenue jumped as the company underwrote more stock and bond offerings, a tentative sign that companies are more willing to take risks like going public or raising money. The bank's investments in stocks and bonds came back from a loss a year ago and turned a profit, riding a wave of higher stock prices around the world. Trading for clients in mortgages also propelled Goldman's results higher, echoing what Wells Fargo and JPMorgan Chase reported last week as mortgage refinancing surged. Goldman's earnings were good enough that the bank raised its quarterly dividend to 50 cents per share from 46 cents. Citigroup analyst Keith Horowitz called the quarter "a very solid performance in a generally poor environment." There were still signs that Goldman could have gaps in its armor. The storied investment bank has been slashing jobs and trimming expenses, and the July-to-September period was no exception. The bank shed about 1,600 jobs, or 5 percent of its work force, compared with a year ago, and cut spending on communications, occupancy and market development. One way the bank makes money is by helping clients execute stock trades. That revenue fell because the bank earned "significantly lower" commissions and fees as trading volume dropped, the bank said. Goldman said that "broad market concerns persisted and levels of activity generally remained low." Goldman had a low bar for beating last year's results. In the third quarter of 2011, Goldman posted a rare quarterly loss as investors pulled out of the market, unnerved by contentious budget debates in Congress and a ratings downgrade of U.S. debt. In a statement, Goldman's CEO sounded a cautious note. Lloyd Blankfein called the quarter "generally solid in the context of a still challenging economic environment," adding that Goldman would "continue to be disciplined in managing our operations and capital." The bank still managed to find more money to pay employees. Compensation expenses more than doubled even though the number of employees fell. The bank said it paid employees more because they increased revenue, and compensation expenses and revenue rose by the same proportion, 133 percent. Goldman is different from most of the other big U.S. banks because it deals almost exclusively with institutions, rather than consumers. Its clients are usually mutual funds, international corporations, other banks and similar firms. Goldman was hardly the biggest story in banking Tuesday. Shortly after Goldman released its earnings results in the early morning, Citigroup announced that its CEO, Vikram Pandit, was stepping down. At Goldman, net income for common shareholders was $1.5 billion, or $2.85 per share. Analysts had been predicting $2.19 per share, according to FactSet. Revenue also beat estimates, breezing past the $7.2 billion forecast by analysts and more than doubling to $8.4 billion, from $3.6 billion a year ago. Goldman's stock rose 88 cents to $125.38.